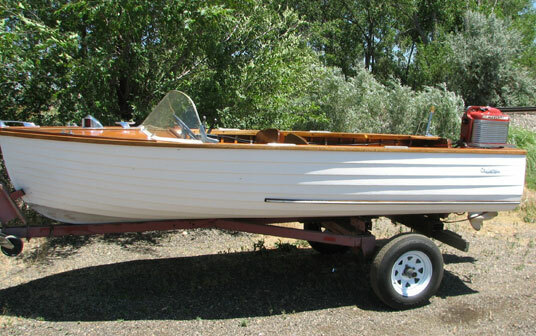 Richard Klein of Boulder, Colorado, bought this 15 foot Cruisers Inc. in Wisconsin from an eBay auction. He redid the garboard's and partially up the lapstrakes past waterline with the West System, and has the bottom paint Micron CSC "Shark White". The remainder of the hull lapstrakes are painted with 7 coats of Sherwin Williams Industrial Marine enamel "Pure White". Interior of the boat is clear marine varnish System-3. So far 3 coats, and will need a few more. No ribs needed to be replaced. Some rebuilding of the stem was needed. He pressed up his own mahogany veneer for all the new decking. The decking and gunwale have 5 coats of "Old Masters" spar marine varnish, Gloss92401. The back seat was removed to accommodate fishing gear and a floor was installed. The boat is powered by a Mk55E short shaft from original owner who purchased it in Cleveland, Ohio back in 1957.